← Broncos Win in Overtime! The Neshaminy Teachers Union in Bucks County, Pennsylvania has called for a strike beginning Monday, January 9th. This public sector union with its arrogant and recalcitrant leadership is notorious for its greedy get all mentality. And although they are some of the highest paid teachers in the state, and don’t pay a dime for healthcare benefits, these educational elites have stubbornly refused to recognize the economic realities facing the school district and its overtaxed citizens. “It’s ridiculous them going out on strike in this time of economic distress,” added Gina Currington, who has a seventh-grader in the district. The union’s fulsome president, Louise Boyd, who teaches high school Biology, continues to portray herself and the other spoiled over-paid teachers of Neshaminy as poverty-stricken victims of a stingy school board. Ms. Boyd, who last year was arrested for driving while under the influence, makes a yearly salary of just under $100,00 and doesn’t have to pay for her medical coverage. Poor, poor, pitiful Louise. Is there no justice?! This entry was posted in Education/Campus and tagged Bucks County, DUI, Louise Boyd, Neshaminy, strike, teachers' union. Bookmark the permalink. 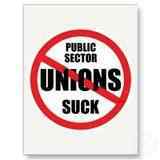 I believe granting public unions the right to collective bargaining is one of the worst ideas anyone has ever had. The unions are far too powerful, the children don’t benefit from the teachers’ union’s power, and you only have to look at what happened in Wisconsin to see how they react when someone tries to take away any of their power. Collective bargaining for public unions is one of the most pernicious forces that exists. Absolutely agree. Pernicious is the right word.